In the last of the light on 22 October 1985, 58002 pulls out of the bi-directional loop at Hinksey (near Oxford) with the 7V65 11:56 Desford Colliery to Didcot Power Station MGR coal train. 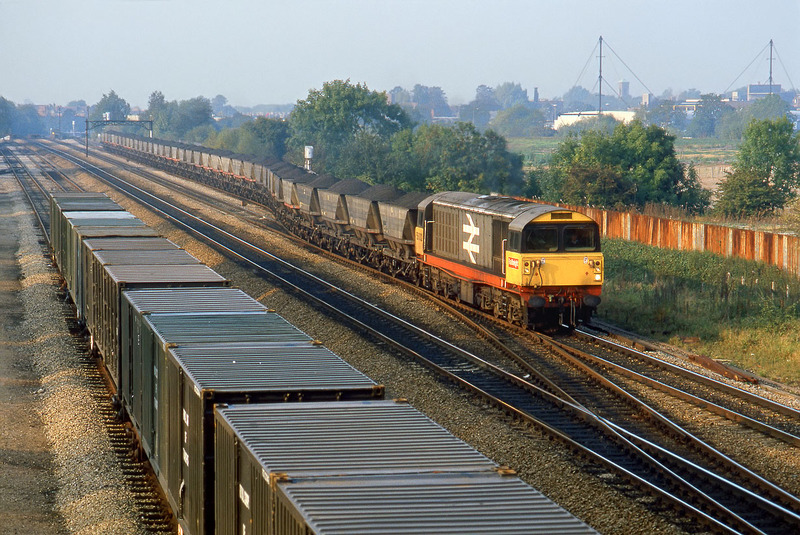 Prior to the 1984 miners strike most of these coal trains were worked by Class 56s, so it is ironic that the reason that this train was looped here was to let 56048 pass by light engine! In addition to southbound freights using this loop, some down DMUs terminating at Oxford would cross over from main line using the crossover in the foreground and use the loop in the opposite direction.